At the end of August a new paper was posted that showed how to “teach” an artificial neural network (ANN) the style of a given painting or piece of art. It built off of earlier work by some people at Google they called inceptionism, from just a few months earlier. Don’t worry. The machines aren’t coming for your paint brushes. Despite their name, ANNs are just a class of algorithms that non-linearly transform a linear combination of signals, over and over again. These algorithms are modeled off of how your brain works, and have come a long way in the last 10 years due to new implementations called Deep Learning. You should check it out. Someone has turned the Neural Algorithm for Artistic Style into a service! 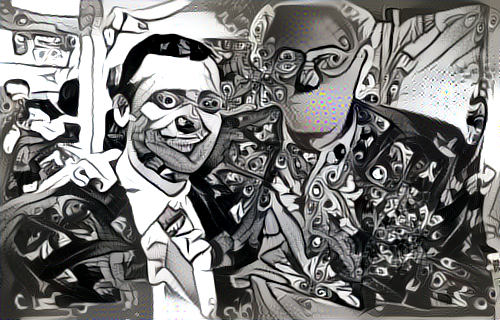 DeepArt.io You upload a picture you want reinterpreted by an algorithm (me and Bernie), upload a painting style you want emulated (MC Escher’s Smaller Smaller), and hit a button! If you pay $2 you get it in minutes. If you don’t pay… I haven’t not paid yet, so I don’t know how long it takes, but it takes less time than it says it will. It’s the ultimate Instagram filter. Enjoy!